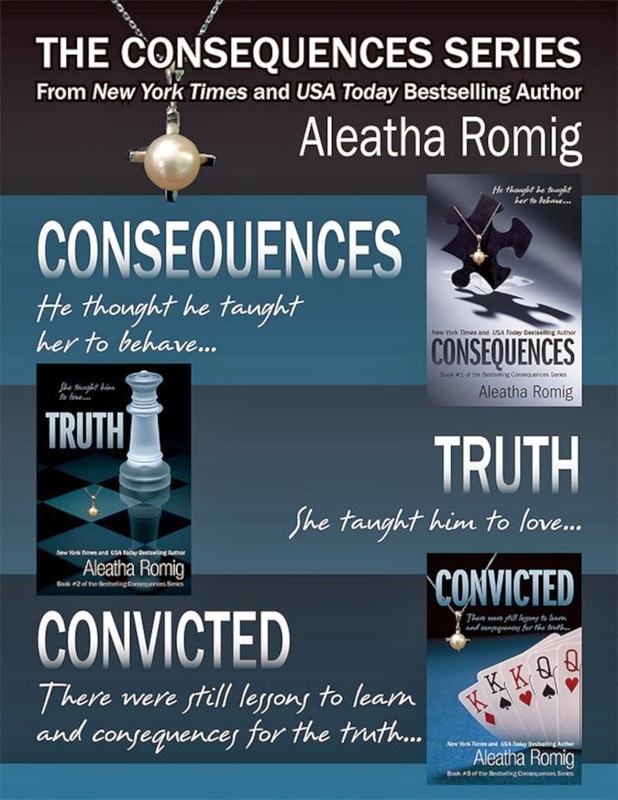 Aleatha Romig has just released the three books in the Consequences Series in one box set! The series is $9.99/£6.43 (which is almost a $3.00 savings over buying each book individually). CONSEQUENCES: Claire Nichols wakes in an unfamiliar mansion and discovers that she’s at the mercy of billionaire Anthony Rawlings. To the rest of the world he’s charismatic and generous. It doesn’t take Claire long to learn that something more sinister lies beneath his polished facade. As time passes, Claire survives, and her strength penetrates Tony’s veneer, igniting passion where only fear had existed. As the pieces of the puzzle come together, the question becomes clear...Is anything as it appears? TRUTH: After enduring Anthony Rawlings’ vendetta, Claire is faced with the consequences of her new freedom. With the help of old and new friends, she strategizes to rebuild her life and learn the truth of the past. Secrets are revealed, true foes are exposed, and Tony admits his true feelings. Claire must decide who she believes—who is telling the TRUTH? CONVICTED: Facing her oldest fear, Claire learns the true meaning of isolation. Who can rescue her from this nightmare? Tony? Harry? Phil? Or perhaps a more unlikely savior? Will it happen in time, or will the consequences of the revealed truths be more than she or anyone can handle? As the cards are played, who will win the game?